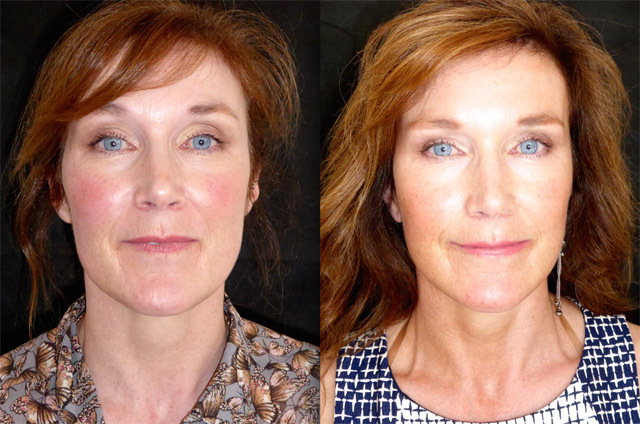 Jan is the perfect example of a beautiful lady who doesn’t conventionally ‘need’ a facelift. Traditional thinking is that if there isn’t lots of excess skin to remove and heavy neck and jowls, then the patient should come back ‘when you are over 55 and need one’. My approach is very different. Jan approached me with reasonable concerns. 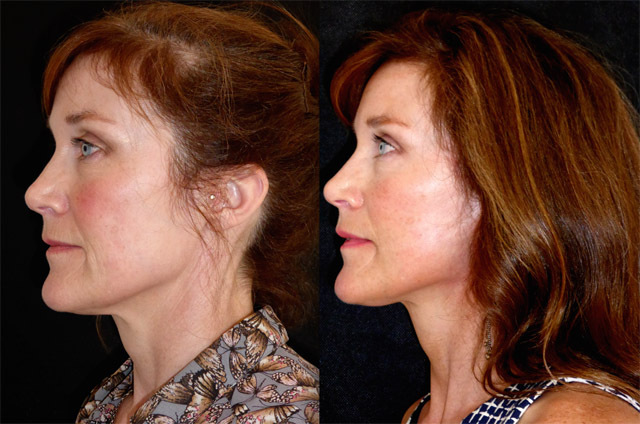 She wanted a fresher look, some tightening of her early neck laxity and a rejuvenation of her jawline. 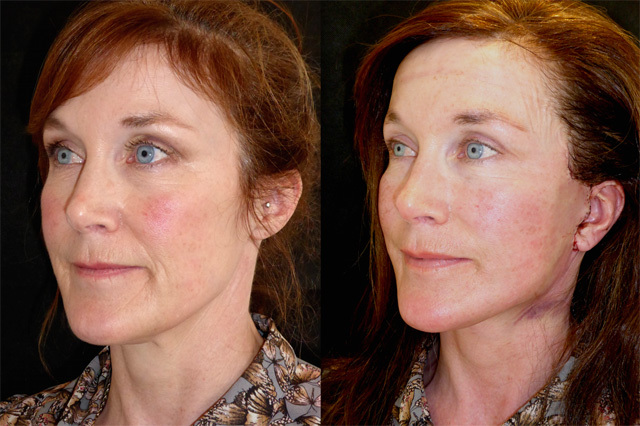 Jan was already booked for a mini facelift with another surgeon when she found my website and was curious! 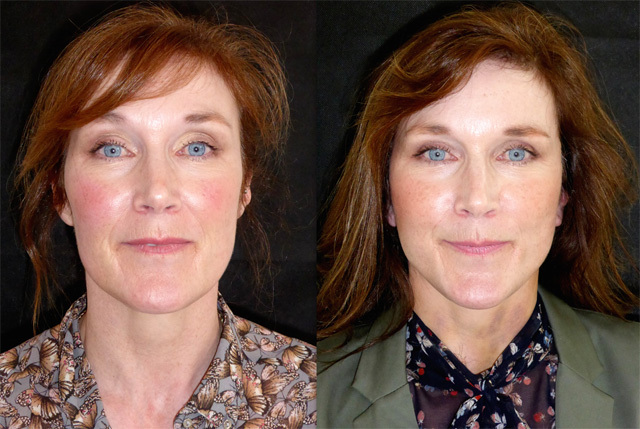 When I saw Jan I explained that in my opinion the mini facelift she had booked would not adequately address her main concern which was her neck laxity. It is very easy to demonstrate this on oneself but lifting the skin in front of the ears upwards. 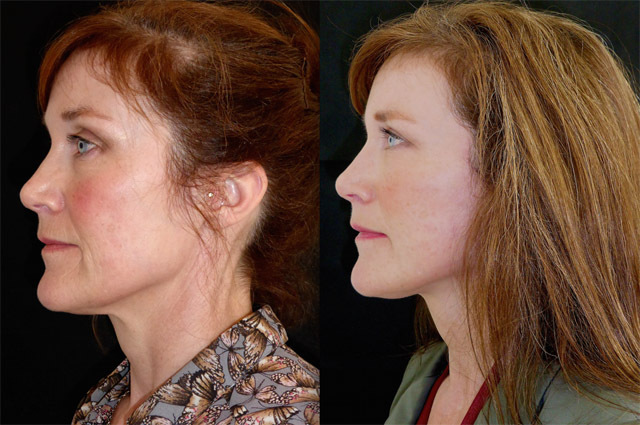 You will see that there is very little improvement in the neck and the main improvement is in the jowl and jawline. 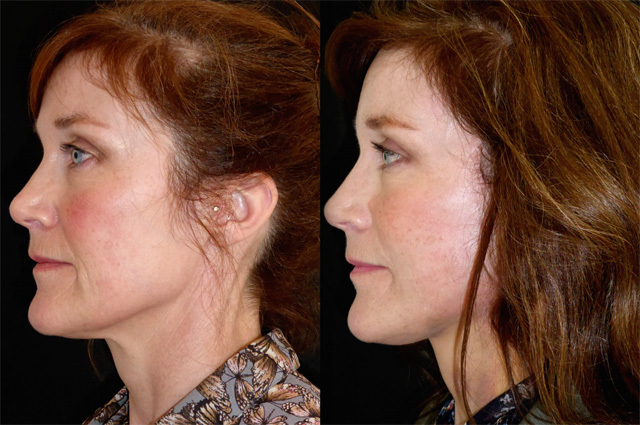 Whilst the cost of a mini facelift is less than half that of a full SMAS face and neck lift, the longevity and outcome is significant linferiorl. 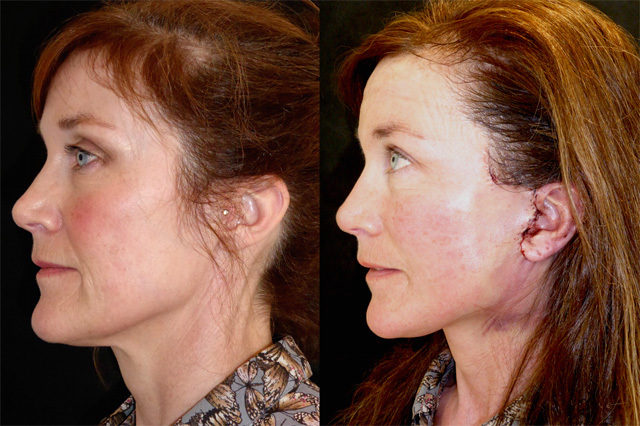 Jan cancelled her planned surgery and proceeded to a full face and neck lift albeit with minimal dissection. Here is the story of her progress. 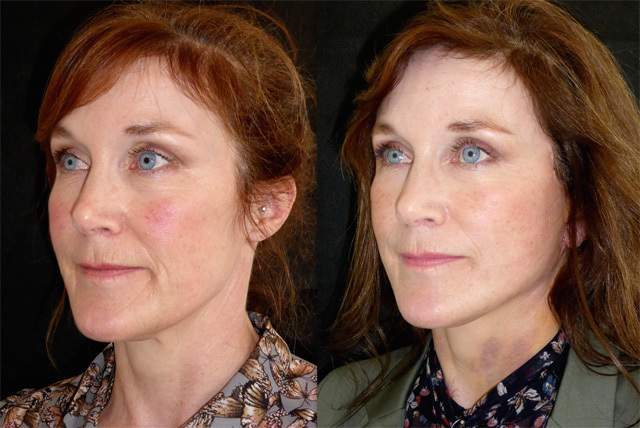 It is hard to believe from these photos that Jan has just had a face and neck lift…. minimal swelling and bruising only 16 hours after I put in her closing stitches. 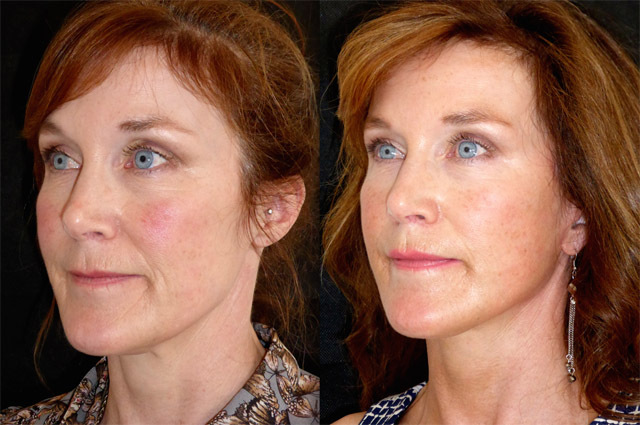 The omission of eyelid or brow work leads to minimal mid facial swelling. Already her neck is tighter, and her jawline defined again. Her profile view demonstrates the extent of the incision I make, what is not shown is the continuation behind the ear up into the hairline. Wow! Jan arrived for her stitch removal today and floated into the clinic. She oozed confidence and radiance. Immediate post operative swelling has gone and her whole face shape has changed from square to heart shaped. 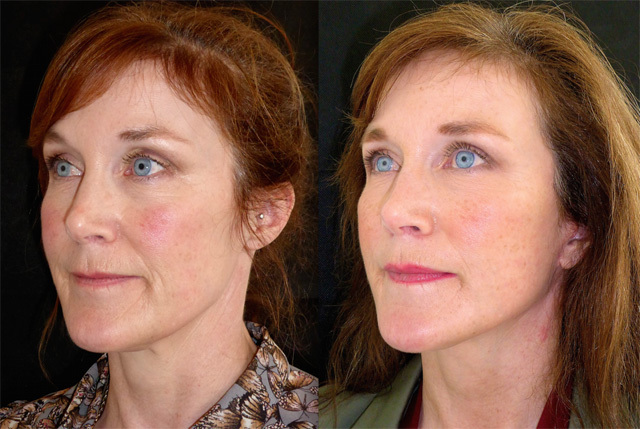 A stunning jawline is visible and her sunken under eyes improved by volumising the mid face with SMAS elevation. No more neck laxity and minimal bruising due to her conscientious adherence to my pre and post operative instructions. She will be back at work in a couple of days; looking like herself, just better! Here is Jan at 4 weeks. Can you believe this super fit lady ran a 10km run 2 weeks after surgery?! She has healed beautifully. A stunning jaw and neck line and naturally voluminous cheeks and complement her unbelievable crystal clear eyes. Such a lovely lady, her colleagues and friends keep telling her she looks great at the moment and so fresh… it must be her hair which she is currently wearing down! Next on the agenda is a little prescription skin care and some injectables to improve her result further. Jan has come back to Harley street to see me for review and I am pleased she did! She looks incredible. Fresh, invigorated and rejuvenated. 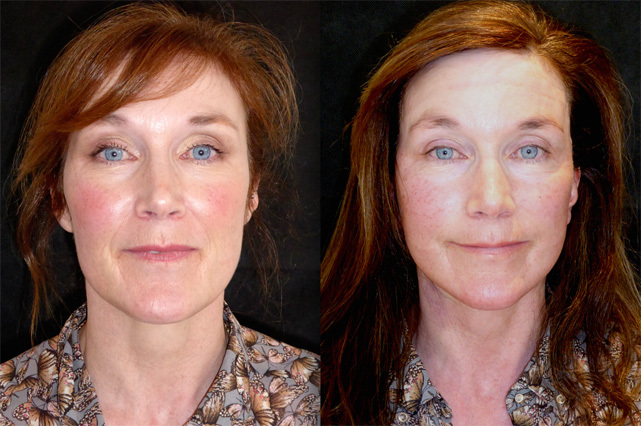 When I first met Jan I explained that I don’t just undertake facelifting for rejuvenation. I also use techniques for beautification. Jan is the perfect example of this. 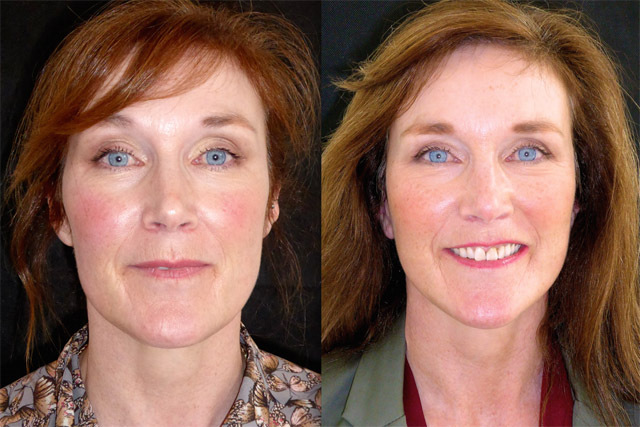 A naturally beautiful woman with gorgeous eyes and great facial bone structure, she made the perfect candidate for beautification facelift surgery. By elevating her mid face, her cheekbones are accentuated, her lower eyelid hollows are reduced and the combination of mid facial volumisation and jawline definition really highlights her extraordinarily beautiful eyes. A little bit of perioral treatment to finish her program and she will look even better…. but she is now setting the bar particularly high!